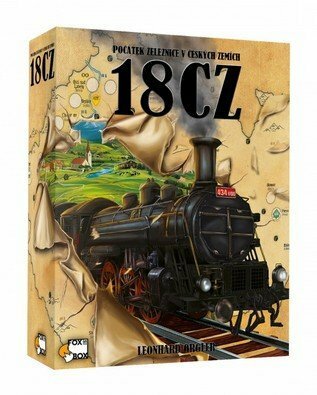 Lonny Orgler’s 18CZ is a new member of the so-called “18XX” branch of the railroad game hobby. 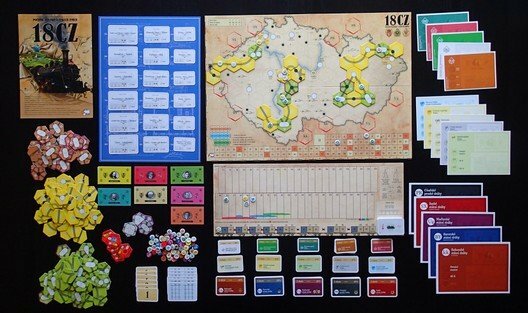 Lonny has eight game designs and several expansions to his credit, starting with 1837, which was published in 1994, and including the popular Russian Railroads, which he designed in partnership with Helmut Ohley. 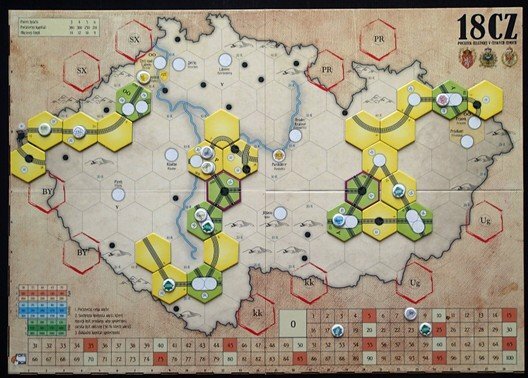 The 18XX sub-hobby is currently enjoying a renaissance, with new and innovative designs being issued not only by boutique 18XX publishers, but also by publishers that serve broader markets. This supports the use of components that conform more to modern boardgame standards—including mounted boards and thicker tiles—while maintaining the clarity of graphics that are needed in order to facilitate play, and 18CZ reflects this trend. The game is available in two editions: one in English and German, and another (which I have not seen) in Czech, with different graphics. 18CZ is noteworthy for its emphasis on a small/medium/large structure. The game includes small, medium, and large companies, each running its own type of train. At the start only small companies may be launched, but over time medium and then large companies become available. Track that is good for one type of train may not be good for a different type, so your track lays must consider not only the interests of the company you currently manage, but also those of ones you may manage later. 18CZ lasts a fixed number of rounds—some in which players buy stock, and some in which companies operate their railroad businesses—and the game includes a turn track that shows the order in which these rounds take place. Unlike in most 18XX games, the game does not end when the bank runs out of money; it ends when you reach the end of the turn track. This simplifies the timing for new players. Another unique and interesting innovation is the small, medium, and large private companies that players may buy at the start of the game. They are bought via a draft, with each successive private of a given size costing more than the one before it (e.g., the first small private costs $25, the second $30, the third $35, and so on.) When no one thinks buying any of the remaining privates is worthwhile, the ones that are left are removed from the game. Most 18XX games have privates, but they work differently in 18CZ. The face value of the privates increases steadily throughout the game, as printed on the turn track. Your company may buy a private from you for up to face value, but fitting the pattern, a company may only buy private companies of its own size or smaller. The private then pays dividends to the company and keeps increasing in value until the company resells it to the bank for the then-current face value, perhaps to help fund a new train. Which privates to buy, and how and when to sell them to your company, is an important and non-obvious decision. 18CZ also allows acquisitions, in which larger companies take over smaller companies, paying the smaller company stock holders for their shares. In an acquisition, the larger company receives the cash, stations, privates, and trains of the smaller company, with a one-time option to upgrade any of the trains to a larger size (suitable for operation by the new owner.) Acquisitions are a valuable tool for managing your railroad empire, but they are not all-purpose problem solvers. You can hurt your position rather than helping it if you manage an acquisition poorly. In addition to the core game, which supports 3 to 6 players, there are two separate variants, set on two additional map boards each of which represents approximately half of the area covered by the map board for the core game. One is a 2-player variant that uses a 3rd dummy player, and the other is a 2 or 3-player variant. Many players ask for 2-player options in games; 18CZ has not just one but two separate and different variants that work for 2 players.